Lots have been happening around here lately. The garden is taking off, all my seedlings have been transplanted. I have been reluctant to pull out my kale since I’ve been making green smoothies to have on hand for the past two weeks. The marigolds are warding off pests and the ladybugs are hatching all over the place! I also went to see a specialist last week. I scheduled more tests and finally for once I could talk to someone who understands what I have been feeling. We talked about my digestion system, food habits, mental health, to my surprise accounts for a large problem to my issues, and Rome criteria and of course poo. Did you know there are 500 billion probiotic bacteria on a piece of poo the size of your thumbnail? Amazing! Preplanning meals has been pretty easy as my husband has adopted my green slime smoothies with open arms and wants to continue to eat gluten free or close to it for as long as possible. Last night I was at my local Mi Pueblo market and I saw a water trough full of lentils. I just had to scoop and take home 5 lbs. I decided to make lentils for dinner, which would be perfect as I will make it vegetarian as well. Drizzle EVOO twice around heavy Dutch oven pot. 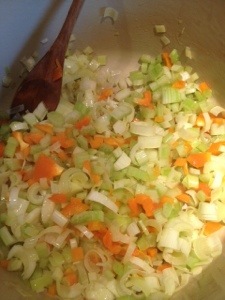 Sweat out onion, carrot and celery for 2-3 minutes on medium heat. Add garlic. Cook 1 minute. Add lentils and spices. Add stock, bring to a boil. Lower heat. 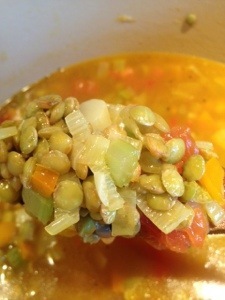 Simmer for 20-35 minutes, covered,until lentils are open. Stir occasionally until most of the liquid has evaporated. 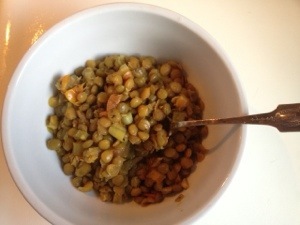 If you like al dente lentils, keep an eye on them after 20 minutes. Your home should be smelling very yummy at this point. If you are anything like me, you will not be able to wait until dinner. I just had to have a bowl for breakfast. I’ve also been busy deep cleaning all closets and cupboards. Ill be posting a few things on ebay and hopefully making some spending $$ for my trip to Peru, which is right around the corner! More on that next week. Until then, make some happenings! This entry was posted in Food, Gluten Free, Personal dialogue for a happy life and tagged gluten-free, healthy eating, Indian on May 7, 2013 by amybailey aka knitsakes.